Incoming Oklahoma Supreme Court Chief Justice John Reif administered the oath of office to 149 members of the state legislature Tuesday during ceremonies at the state Capitol. Gov. 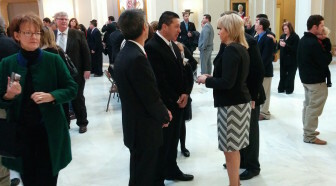 Mary Fallin talks with new lawmakers following swearing in ceremonies at the state Capitol, Tuesday. Members of the Oklahoma House of Representatives took their oath of office at 10:30 a.m. Tuesday, while members of the Oklahoma Senate were sworn in at 11 a.m.
Reif administered the oath of office for both Houses. Republican Gov. Mary Fallin, reelected to a second term, greeted lawmakers during a reception on the fourth floor of the Capitol. “Every session has its own personality,” Fallin said. 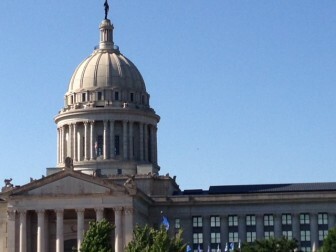 The first session of the 55th Oklahoma Legislature will convene in February. A proposal to create bond-financed trusts for Oklahoma’s common and higher education systems will likely face a difficult path in the legislature.